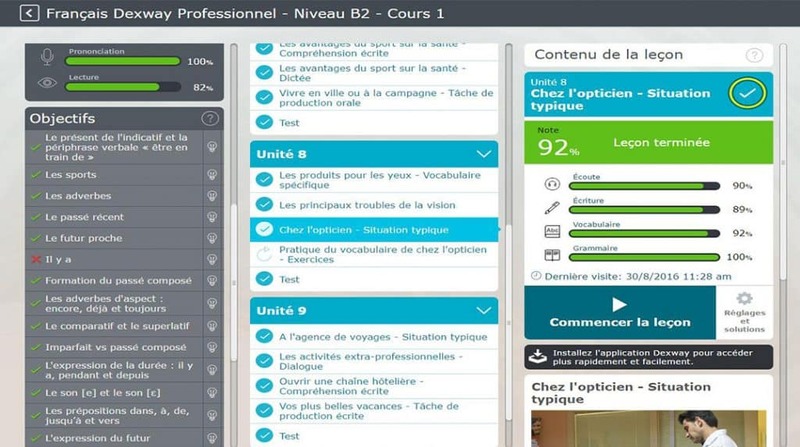 CAE has incorporated the Analytics function into their Dexway French courses in order to offer both teachers and students a more detailed view of the actual objectives that each course proposes to achieve. Analytics gives an analysis of student progress for each lesson or unit either individually or as a group, and it means at any given moment you can check results or improvements. They can even verify the results for the mid-course tests and end-of-course tests included in the French courses. Thus it enables educators to easily and neatly assess the group of pupils and depending on the results determine the areas of strength, and thus work on weaknesses and/or deficiencies during class time. In addition it is also an advantage in many ways for students thanks to this system all points or lessons where the students show weakness within the curriculum can be reinforced. Analytics automatically detects in real time the areas that are not being understood and/or skills that are not developing properly for the majority of students so that these can be proposed for review during the live classes, in this way learning is improved for the whole group with lessons that truly meet the needs of the students.